A festival in conversation with Darkness? What’s that all about? Why so negative? 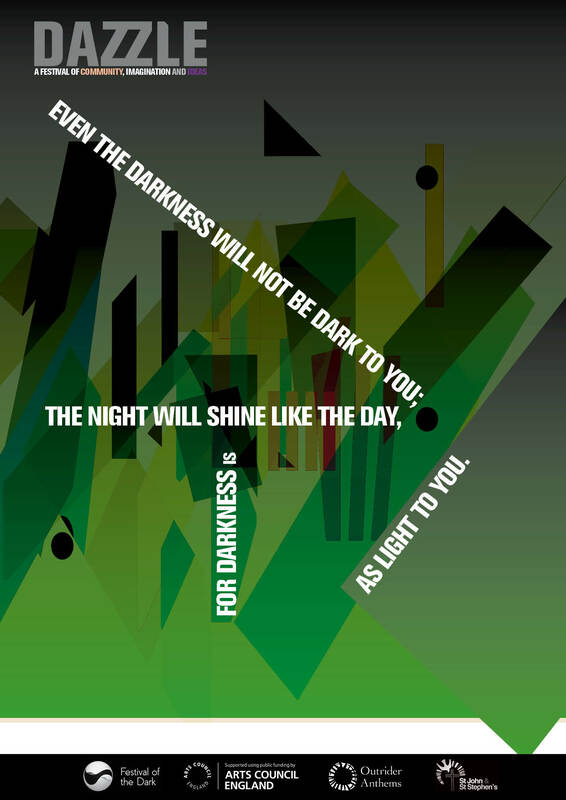 Don’t we need light, rather than darkness? DazZle is a bit unusual. But DazZle will also be lots of fun, friendly and inspiring. It’s a series of events, art, performances, talks, discussions and meditations over ten days in the Newtown area of East Reading. All are welcome to come to events; maybe one, two or all of them! Most events are free, although some have an entrance fee, (plus concessions). 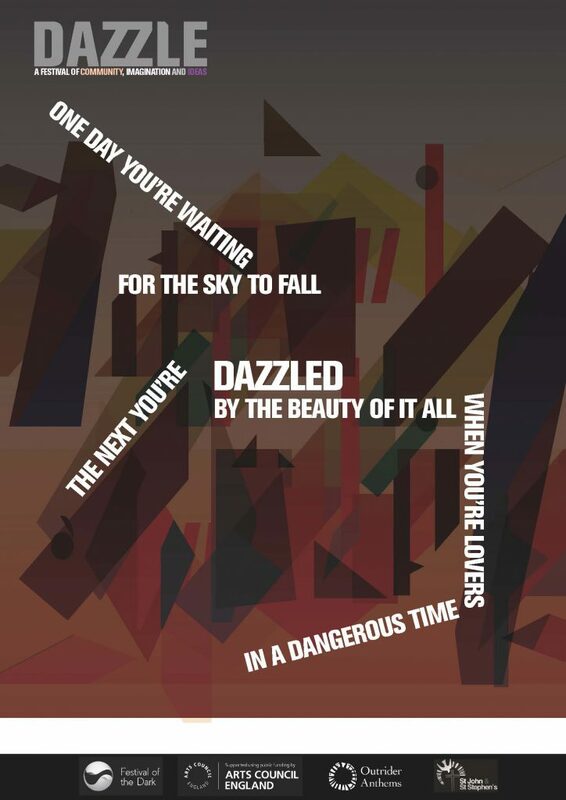 So what is DazZle trying to achieve? Our main priority is fun! A way to enjoy some of the life and creativity of the area. 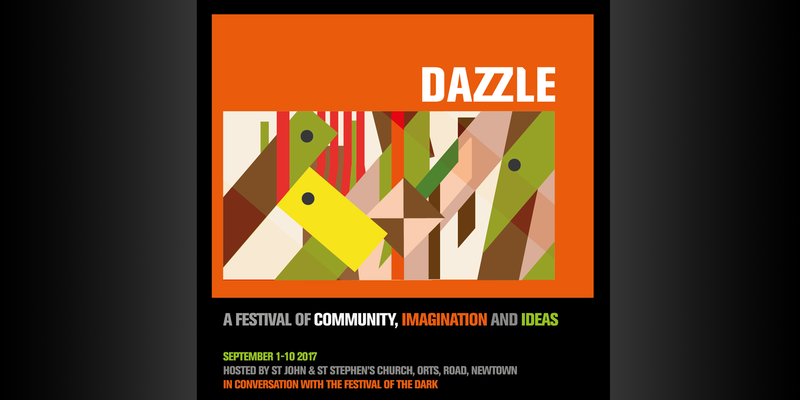 Moreover DazZle is trying to explore questions about community, education, the future, the environment and a rapidly changing world. 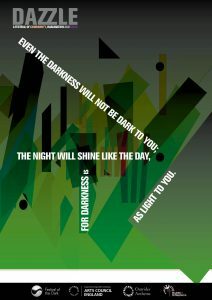 What is Darkness? What does it mean to you? It can cover all sorts of areas; fear, oppression, doubt or uncertainty. It might mean the world at large, with its instability and injustice. It can also be a way of describing ‘the shadow’ – the parts of ourselves we hide or exclude. Darkness might suggest risk – a step into the unknown. When we express these things together, we discover that humanity is united by experiences of darkness as well as light. Lament – as opposed to denial – contains the real possibility of hope. But darkness is also a place of growth; seeds only germinate in the dark, when someone prays or meditates, they close their eyes. Midnight is where the day begins. And in this place we find compassion, love, mercy and the energy and inspiration to embrace our world and our community; to think about the way we live, teach our children, care for the streets and our neighbours. So DazZle is a little offering. It’s a seed of wonder planted in realistic soil. Through these ten days we will play, laugh, think and listen to one another. It is only a beginning… Please join us.